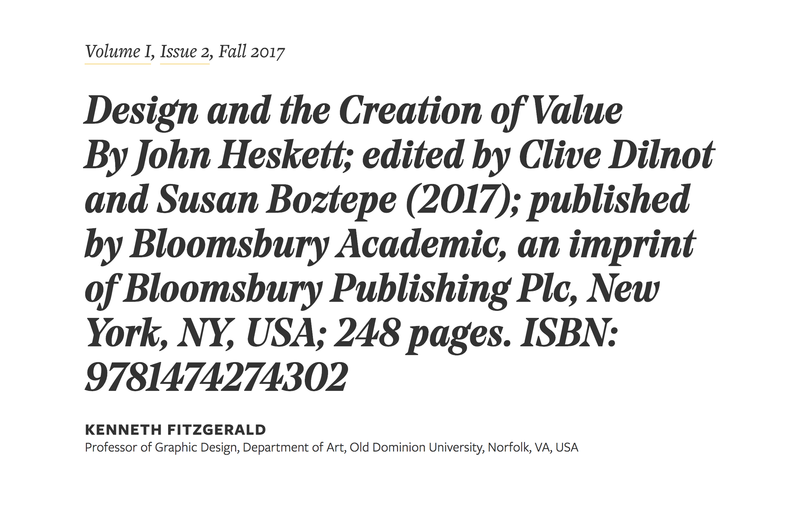 Book cover Design and the Creation of Value, by John Heskett, edited by Clive Dilnot and Suzan Boztepe (2017). If designers have a central precept, it’s that their activity creates economic value for commercial interests, which practitioners regard as their predominant purpose. Within design, even among students, this pecuniary capacity is considered self-evident. But the eternal lament among design professionals is that business isn’t grasping this certainty, or only does so erratically. Design is largely regarded by the outside world as a frivolous afterthought. Failing to outline the exact mechanism by which this value addition operates has hampered design’s cause from a business viewpoint. It has instead proffered the testimony of prominent executives such as former IBM Chairman and CEO Thomas Watson—“good design means good business”—as evidence, which has proved not to transfer or extend successfully. Though illustration more than argument, Apple’s market dominance due to celebrated dedication to design has also become a staple citation for the necessity and economic value of design. Still, despite these testimonials and, little traction has been gained in getting business to understand design’s import in their potential profit, and in securing designers an influential seat at the corporate table. If anyone should be able to recognize and articulate the argument for design as a primary component of financial reward, it would seem to be economists, who ostensibly study and propose business best practices. This is not happening, either convincingly enough or at the necessary scale. It seems as though economists are unable to understand or impart the importance and influence of design economically in the same way that designers are reluctant to view their practice as being purely profit-driven. As to designers’ fluency in speaking about economics, many regard themselves as adroit if they’ve operated their own shop. That’s about it, and business isn’t relating. Meanwhile, when designers encounter economic concepts such as “ROI” (Return on Investment), they often instinctively recoil. Design education and theory have also failed to take into account economic forces and justifications for the divide in understanding that exists between these two disciplines. 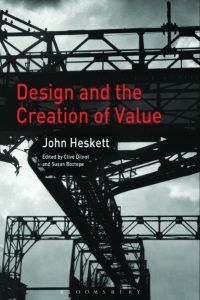 Design and the Creation of Value by late British design historian John Heskett, is a long-overdue attempt to address the estrangement between economics and design. As Sharon Helmer Poggenpohl says in her afterword, “Economics and business understanding are missing links in design practice and education and few have the interest or are capable of going beyond basic comprehension.” Heskett attempts to forge those links and direct possible ways forward. Because it focuses on design’s core rationale, my impulse is to pronounce this short, posthumously assembled volume as one of the most important texts ever offered on design. I argue that this is one of the field’s essential books. In addition, separate to its specific content, it also stands, in Poggenpohl’s words, as “a scholarly gift” to design education because of its concise message and essential purpose. The book was assembled from notes for a seminar Heskett last offered in 2009 at Hong Kong Polytechnic University along with a related draft and incomplete manuscripts. Heskett contemplated forming this material into a book, but never actively began the process. Editors Clive Dilnot and Susan Boztope have done an exemplary job of shaping the disparate and fragmentary material into a coherent and substantive whole. Rather than detracting from its impact, the rough, fragmented status adds a level of immediacy. Both Heskett and the editors regard this study as just the opening of a wide-ranging, extended discussion. The book’s incomplete condition may act as a more inviting prompt for additional research. Immediately, Heskett acknowledges discussing the relationship of design and economics as a “minefield,” due to the “deep schism of mutual incomprehension [that] separates them.” Neither field is adequately versed in the other’s concerns. There seems to be little appetite for finding a solution for the situation from either side. Fortunately for us, it’s Heskett that sets himself the task of charting the landscape of economic theory and its implications. He is a lucid and engaging guide, summarizing some of the major economic theories without sacrificing relevant and important nuances. (Dilnot and Boztope provide two affirmations from economists on Heskett’s competence in their area). Dilnot’s introduction provides a detailed and candid assessment of the book’s achievements and limitations. The transparency and comprehensiveness of his notes are immensely valuable beyond this particular study due to the resources and methodologies it contains. Rather than limiting the appreciation of Heskett’s work, or channeling and relying on readers’ expectations, Dilnot’s opening provides important context for what follows. Part one of the book, “Economic Theory and Design,” moves through the major schools of economic theory: Neoclassical, Austrian, Institutional, New Growth, and The National System. Each is outlined deftly in text and is paired with a diagram to show how it presumes commerce operates. Further readings are provided for those wishing a deeper dive into the theories discussed. Neoclassical theory is probably the most widely familiarized economic perspective among readers, as it constitutes the mainstream of economic thought in contemporary westernized capitalistic nations. Devised between the world wars, its terms and premises guide what is considered to be “economics” today. The features of Neoclassical theory contain the familiar concepts of markets, goods and service, supply and demand, and Adam Smith’s famous and highly influential “invisible hand.” Design’s inability to gain respect in the business world derives from its status within Neoclassical theory—or, more accurately, its total absence. Neoclassical theory is a “static” model, concerned with what is and not with what might be. Neoclassical theory doesn’t concern itself with the devising, planning, and manufacturing of a good. The good simply exists. Heskett presents design as concerned with change—design is about devising, not about maintaining what already exists. “Dynamic” theories, such as Austrian and New Growth, offer design the most potential for respect and inclusion in the economic and business conversation. Heskett outlines three areas of “concern” for designers in current economic thinking: technological opportunity, innovation, and its functioning within institutional structures. Heskett’s thought is that emphasizing these aspects may improve design’s argument for inclusion. More than locating design’s possible role in various economic theories, Heskett uses design as the key means to evaluate them. Each theory is subjected to critique, weighing its merits intellectually and practically, determining its conformity or nonconformity to actuality. In his analysis, Heskett assigns design a profound role in his analyses as a decisive test. Design’s purpose in each theory stands as key intellectual and practical proof of its contemporary viability. Here, Heskett is paying design a great compliment by explaining the importance of the role it plays in the fiscal sphere that guides global commerce. Design and the matter of value may serve as an indicator and prompt for (in Dilnot’s words) “change and evolution” in economics. Part two, “Design and the Creation of Value,” is briefer and examines design and economics from the “design outsiders” standpoint. The chapter inverts the approach of the previous chapter, directly tackling the book’s central premise. Heskett provides a skillful summary of his arguments, providing numerous opportunities for subsequent scholarship to expand upon the ideas. Throughout the book, Heskett speaks as an advocate for design, but is just as frank about the field’s intellectual shortcomings. Foremost is design’s often-curt dismissal of economics’ concerns. “From the point of view of designers’ attitudes toward economics, there is mistrust of the dominance of numerical calculation and financial management in corporate administration, something perceived as alien to how design functions. Setting aside the irrational aspects of what is indeed frequently an exaggerated, defensive reaction, and the deficiencies of some designers in clearly articulating their ideas, there is nevertheless substance in such perceptions.” Still, this perception shouldn’t lead to the frequently wholesale rejection of economics’ measures of design viability. Heskett’s interrogation of terms throughout is unfailing, especially when considering “value.” Though profitability to a producer is naturally given prominence when considering how “value” is defined, it should not be limited by the exclusion of broader, intangible considerations. Ethical and personal constructions are both acknowledged, while value judgments exist in an artifact’s planning, production, acquisition, and use. Each circumstance demands its own consideration, according to Heskett. Hovering over the discussion throughout, but never named, is the practice of branding. “If goods help us construct personal meaning and have social relevance, these are obviously important considerations in how value is created,” Heskett states. Of the many implications in his text, branding’s rhetoric and impact is possibly of primary significance in the call for economists to understand the fiscal value of design. For designers, this section contains the most culturally profound — and lucrative — expression of how audiences construct personal meaning from designed artifacts. These ineffable and individual value assessments are the hardest to chart. An appealing aspect of Heskett’s writing and his approach to the topic is a humanism that prevents people from being the automatons frequently described in economic and design theory. Heskett forthrightly acknowledges a broader meaning for value and design. As design can serve as a test for economic theory, consideration of value may enhance and enlighten our understanding of design and economics on the whole. According to Dilnot, value may serve as a “third term,” or a “new object and new language that belongs wholly to neither field,” to “allow a general exploration to begin.” Dilnot takes his idea—which he acknowledges is “incongruous” in this context—from Roland Barthes’ use of the concept of “text.” Barthes’ use of the term allowed him to “rethink” what constituted a “literary work.” Dilnot suggests that if similarly deployed, “value” could illuminate both design and economics. The fragmentary nature of this book can prove frustrating at times, as several dense and elusive ideas are given relatively short shrift. And as inclusive as Heskett is, there are boundaries and conventions attached to a number of his declarations. His view of art (under Appendix 2’s “Aesthetic value”) seems decidedly romantic (“the outcome is a surprise to the artist and the result created in dire straits”). This leads to the conclusion that perhaps the art marketplace would be possibly a more fecund ground to explore value generation. Under “Moral Value,” Heskett is at his most terse: “Moral or ethical value seems to have limited relation to design.” That single sentence begs an extended exegesis. And under “Intrinsic Versus Extrinsic Value,” he finds that, “It is difficult to identify any intrinsic value of design.” As someone that purchases record albums solely for the packaging—and who has no interest in listening to them—I seem to elude that claim. Perhaps this only reinforces the ultimate personal nature of value. But once again, branding raises its head. As to the value of Design and the Creation of Value, it is profoundly pronounced and plentiful. For practitioners, the book lends substance to long-standing contentions. There is potential for designers to become conversant in the language of economics and to understand the derivation of its ideas. Greater still is the potential for design to transform the practice of its major patron. For educators and researchers, the book succinctly describes the commercial landscape where design is publicly performed. Though centered on economics, it provides numerous prompts and directions for further significant research. Heskett, Dilnot, and Boztepe have presented design with a truly essential text, one that, to be and to remain relevant, practice and education must engage.